Means of small-scale mechanization, which have become popular in recent decades, greatly facilitate the life of summer residents, farmers, and residents of villages and villages that have certain areas of agricultural land at their disposal. Cultivating the land and caring for crops requires less physical effort and time-consuming if you buy a motor-block or a motor-cultivator. 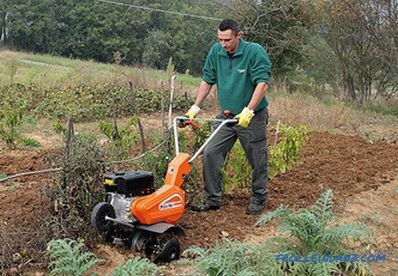 These are relatively inexpensive machines based on gasoline engines, with which you can perform a whole range of soil treatment, plant care and harvesting activities in areas ranging from 10-15 hectare to 2-3 hectares. Most of these machines are characterized by reliable design, ease of operation, economical fuel consumption and versatility. With their help, you can perform: plowing; cultivation; cutting rows; hilling; weeding; potato harvesting; grass mowing; cleaning the yard and the tracks from the snow ... And many more operations that previously required hard physical labor. 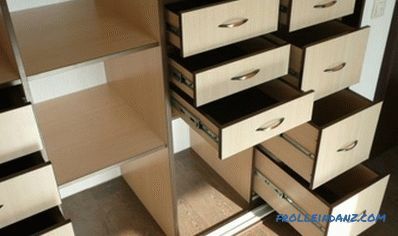 It is only important to determine the volume of the proposed work and choose the right equipment. 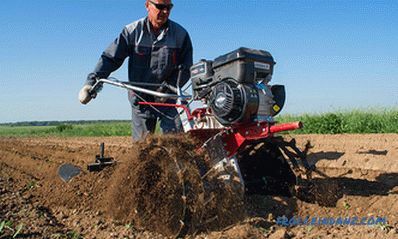 The first problem that arises when choosing this technique is a motoblock or a motor-cultivator, what to choose for your needs. Next we look at this problem in more detail. Very popular cars based on mainly gasoline engines. Motor power is 3 - 6 liters. with. , and the weight of the unit reaches 60 kg. The mass range is quite significant - you can find cultivators weighing about 20 kg, and buy models in which the installation of special ballast weighting is provided, increasing the total weight to 100 kilograms or more. This is required when working on heavy soils and performing certain operations, which will be discussed below. The functionality of motor-cultivators is rather limited - soil fluffing, weeding, inter-row processing, and in some cases hilling. 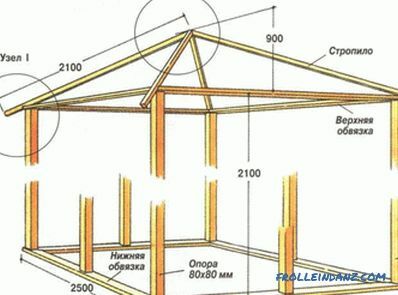 Scope of use of motor cultivators weighing up to 50 kg - cottage and household plots with an area of ​​up to 15 - 20 acres, flower beds, greenhouses. 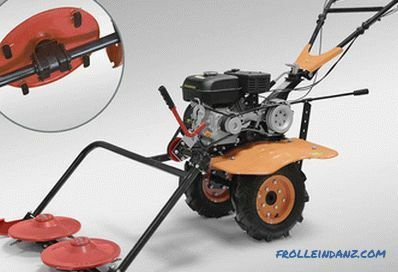 The working body of the motor cultivator is a sectional rotating cutter 35–70 cm wide. Due to the removable sections, the cutter width can be changed, which is very convenient for processing different crops with different row spacing. The milling cutter is also the engine of the unit - clinging to the ground pulls the cultivator forward at a speed that is regulated by the throttle grip. Modern models of motor-cultivators can be equipped with gearboxes of variator or gear types with or without reverse. As a rule, gearboxes are installed on devices heavier than 50 kg. The number of gear for most models is not too large - 1 + 1 or 2 + 1. Instead of a milling cutter on metal models, you can install metal wheels with grouser. This makes it possible to use trailed implements - plows and hillers. But practice shows that even heavy motor-cultivators cannot cope with plowing, and spud potatoes at an acceptable level of quality only on light soils, even in the case of pre-processing between rows with a cutter. Summarizing the information, it can be stated with certainty that motor-cultivators have the right to life, and even have their own advantages over the motor tillers, but only if they are used in small areas and inside artificial structures. The main operations with which most cultivators handle are “excellent” - loosening the soil with a mill and processing between rows. In the dispute that a motor-cultivator or motor-block is better, one cannot definitely take one side or the other. This is about the same as comparing a tracked tractor and a passenger car. 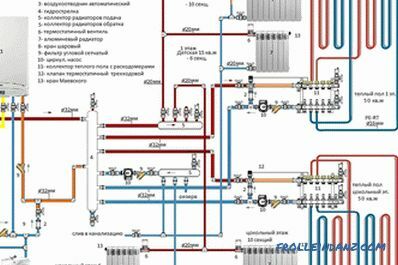 Each unit has its own purpose and features. If we compare the same operations, the motoblock copes with them more confidently than the motor-cultivator, but in return it is more expensive, heavier, consumes more fuel. 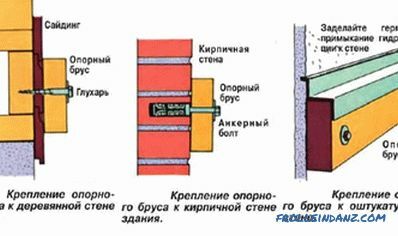 Motor-blocks based on gasoline and diesel engines are produced in approximately equal proportions. 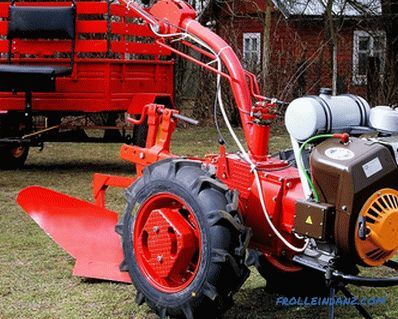 Gasoline engines are installed on light and medium tillers, weighing 50-150 kg, diesel engines - on a considerable part of medium and heavy ones, whose mass can reach 300 kg. The power of lightweight motoblock engines is about 6 liters. with. , medium - up to 8 liters. with. and heavy - 8 - 12, and even more horsepower. 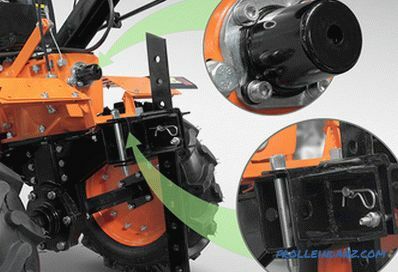 The main difference between a motor-block and a motor-cultivator is the presence of pneumatic tires and a power take-off shaft, which allows you to connect a wide loop of attachments — the same milling cutter, mower, pump, wood splitter, etc. The pneumatic wheels are used both in the transport and in working position. Motor-blocks of all types and full-fledged gearboxes with obligatory rear speed are equipped. Medium and heavy tillers can have up to 4 - 5 forward gears and 2 back.But most models have simpler transmissions with 2 - 3 front and one reverse gear. The engine is started either manually or from an electric starter (on some professional-grade models). 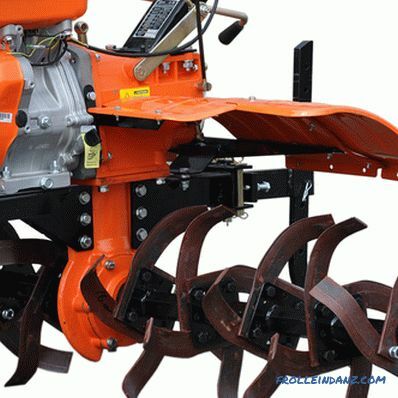 Motorblocks confidently work with almost all types of agricultural tools. They can plow, cultivate, mow, dig potatoes. It is very convenient to use them as a vehicle - most of the motoblocks are equipped with trailed carts with a carrying capacity of 0.3 - 1 ton. The speed of the motoblock with a trailer may exceed 12 km / h.
Medium and heavy versions of the motoblocks are equipped with a lockable differential that allows working on heavy soils, wet grass and moving on blurred roads and arable land. There are also transitional models on the market, which by their basic parameters resemble a walk-behind tractor and carry a lot of weight, gearbox, gearbox, but do not have a power take-off shaft. 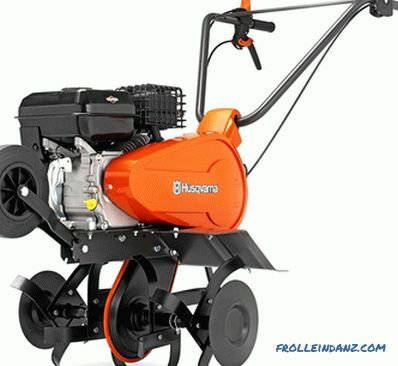 In fact, it is a motor-cultivator on a wheel course and it is often difficult to understand the difference between a motor-cultivator or a motor-block. These are intermediate models that have absorbed all the best from both cars. 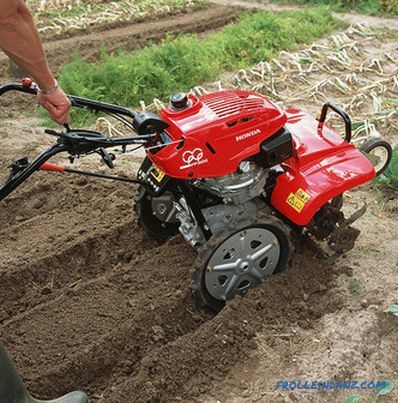 A cultivator is an ideal machine for giving and a small plot. 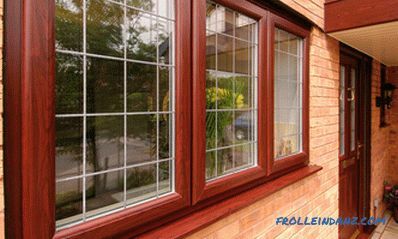 Some European, American and Japanese models can be used for professional work in landscape design, gardening, greenhouse. They perfectly loosen the soil almost to the state of fine sand or flour, destroy weeds, and the possibility of changing the width of the milling makes them indispensable in horticulture. 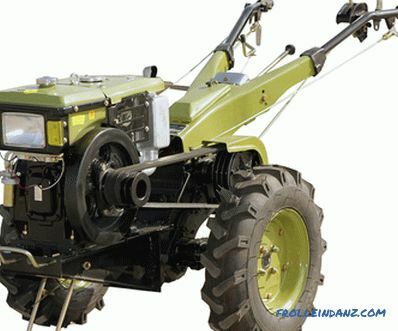 In terms of their functionality, they are practically not inferior to light tillers - there is not only the possibility of transporting a trailer, but few people use light tillers as a vehicle. 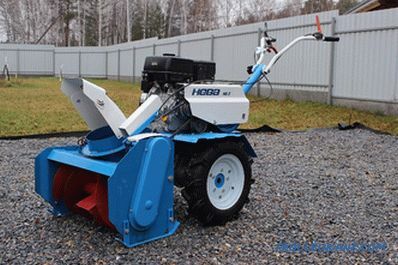 If you have processed the land and later you need to maintain its condition from year to year, making milling, then a motor-cultivator weighing 30-40 kg will be the best choice. For greenhouses, you can choose a model of a cultivator weighing 20 kg. A motoblock is a universal tool that allows you to perform not only milling, but also other various operations. Therefore, if you only need cultivation, then you should not spend money on the walk-behind tractor. A motorblock should be bought only if there is a plot of about 0.5 hectares, you need to connect active equipment and transport various agricultural, construction and household cargoes over short distances. Motorblocks, especially heavy ones, have the functionality of a mini-tractor. If you plan to work with rear attachments such as a plow, a potato digger, a double hiller, then you cannot do without a motoblock. At the same time, the heavier the motoblock will be, the easier it is to work with rear attachments, but the harder it is to produce milling. To work with the plow should look at the tillers weighing 100 - 120 kg. 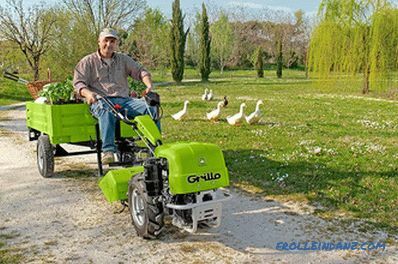 In addition to working the land, the tiller allows you to attach the grass mower. There are two types of such mowers - knife and rotor. They can be adapted for both mowing hay and lawn mowing. 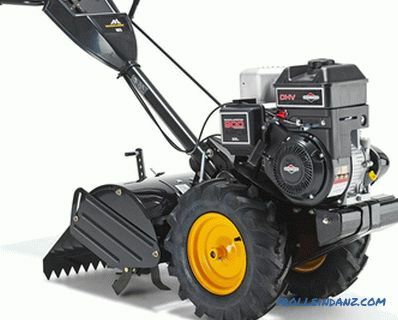 In winter, you can attach a rotary snow blower to the motoblock and use it to quickly remove snow from the tracks around the house. Recently, there has been a tendency to equip the motoblock with a front steering axle and turn it into a four-wheeled agricultural machine with a delivery capacity and breadth of service for a private farm, park and public utilities or medium in size garden and greenhouse facilities. When choosing the necessary equipment, first of all, it is recommended to focus on the volume and type of work for which it is purchased. It should also be remembered that the more powerful the motoblock or cultivator, the harder it is to manage it. 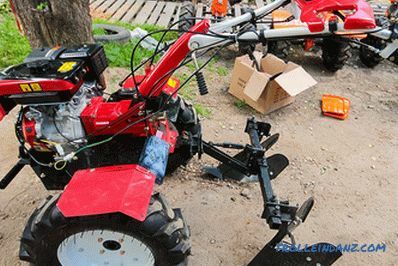 For pensioners and women working in household plots, it is best to buy an average-sized motor-cultivator, and for full-fledged use in the commodity economy - a motor-block.